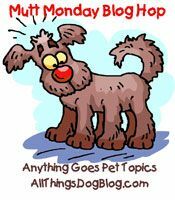 All Things Dog Blog All Things Dog Blog: Pet Fan Mail, Global Pet Expo and Free Advertising: Mutt Monday Goes Wild! Pet Fan Mail, Global Pet Expo and Free Advertising: Mutt Monday Goes Wild! Fan Mail for My Boys! Global Pet Expo is over now and I'm back on the job...behind, but exhilarated by the new products and relationships forged at the convention. I returned to a single piece of mail among the bills that made it all worthwhile--a letter from Schooner and Skipper to Tanner and Oliver. It is things like this that my readers do that make me so forever in love with my job. I feel very blessed to be missed and especially to have readers who really seem to care. Thank you for your loyalty and support! While at Global I had the opportunity to meet some new blogging friends, while also catching up with some 'old' ones. It's always nice to learn what's new with everyone else. Speaking of new, bloggers who would like to link up to Mutt Monday now have the opportunity to win advertising on All Things Dog Blog. All of you can vote for your favorite posts here on Mutt Monday with the "Likes" below each entry thumbnail. The winner will be the blog with the most likes after next week's Mutt Monday closes. HINT: There's currently a tie, as my blog is not in the running. That means voting is that much more important. EVERYONE can vote, so please share your favorites below. Bloggers may feel free to link up as many recent posts as they wish to highlight here. This really is a no-rules blog hop. We simply ask that you keep it family friendly and pet-themed. Good luck and enjoy!